Say you’re a business with an outdated and ineffective website and are in the market for an updated website. The first thing you’ll probably do is tap into your favorite search engine to find a reputable digital web company in your area. But then what? How do you decipher whether or not the digital web company can not only provide functional web solutions, but do so without making the entire digital web design and development process seem like drudgery? Creating an online presence for your small business involves more than your company’s name and contact information. Left unmanaged, small-businesses miss out on the benefits of online-generated traffic that could grow their bottom lines. Finding a brilliant digital company to carry out your message is a great way to start. But for those unacquainted with the web design and development process, looking for an agency who can translate your goals into concrete deliverables is another challenge. 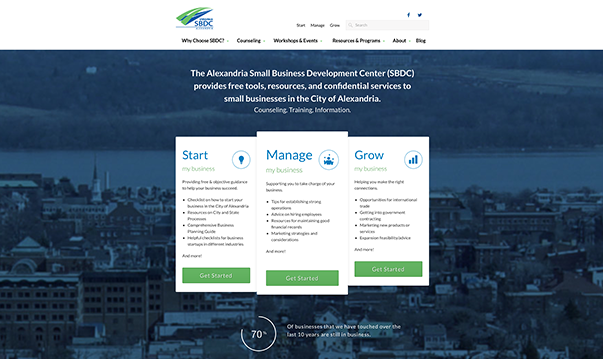 Although I could go on about all the reasons why WDG is the right digital web company to provide web solutions to your online needs, don’t take it from me: read the full article on Alexandria News to learn more. Curious about our complete web design and development services? The Web Development Group (WDG) is a premier web design and development agency in the Washington, DC region. Get in contact with us today.